At least 15 people have died during Hurricane Harvey’s assault on the Texas coast and Houston, including a Houston police officer. A Port Arthur shelter flooded, forcing an evacuation of evacuees. A chemical plant in Crosby, Texas, had to be evacuated due to an explosion risk Tuesday. The Toyota Center has been opened as an additional shelter for evacuees. Houston Mayor Sylvester Turner has imposed a curfew on the city. The death toll rose to 15 Wednesday as flooding from Harvey continued in Texas, including Port Arthur, where flooding prompted officials to begin shut down the nation’s largest oil refinery. 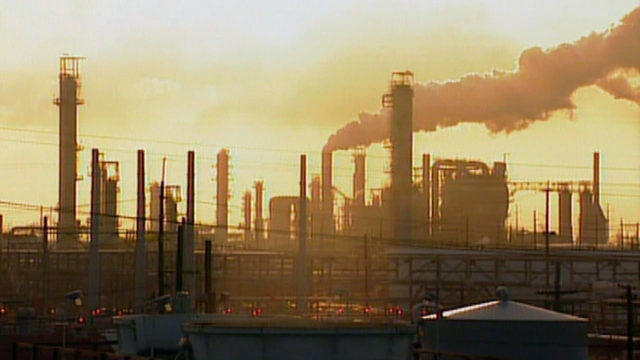 Motiva told media outlets it began shutting its Port Arthur refinery around 5 a.m. Wednesday “in response to increasing local flood conditions” and will remain closed until flood waters recede. Motiva joins 12 other refineries that have shut down as a result of flooding from Tropical Storm Harvey. The plant began reducing production at the plant for days and was at 40 percent capacity late Tuesday, CNN reports. Evacuees in a Port Arthur shelter awoke Wednesday to several feet of water. Pictures posted to social media show flood waters surrounding cots once occupied by evacuees at the Bob Bower Civic Center. According to 12 News, officials opened bleachers in to get the evacuees above the water and plan to transport them evacuees to the Carl Parker Center about five miles south of the civic center. Officials noted, however, that the Carl Parker Center is not ready to receive the influx of refugees because there are no supplies yet available, the Port Arthur Police said. Overall, some 18,000 people have been rescued from the flooding in southeast Texas. The Federal Emergency Management Administration says nearly one million people have registered for assistance. Officials confirmed the death of a Houston police officer Tuesday, who drowned while on his way to work was a victim of Harvey. Turner identified the fallen officer as 60-year-old Sergeant Steve Perez. Perez, who had been with the department for more than 30 years, was in his patrol car Sunday morning when he got trapped in high water at I-45 and the Hardy Toll Road, the Houston Chronicle reports. Despite thousands of rescues, city officials worry that the death toll could jump dramatically. A woman in Beaumont died Tuesday after being swept away by floodwaters while holding her child, AP reports. Local police said she pulled her car into a theater parking lot, where it became stalled in high water. She took her daughter and exited the vehicle, but was swept roughly a half-mile away. A rescue crew spotted the woman floating with the child, who was holding onto her mother. The child was suffering from hypothermia, but responsive. Officers pulled them into their boat, but the mother was unresponsive and efforts to revive her failed. The child has been hospitalized in stable condition. Alexander Kwoksum Sung, 64, drowned at his workplace in South Houston Sunday. A 33-year-old man drove around a barricade and drowned in Montgomery County on Tuesday. A woman died in in the same county Monday after a tree collapsed on top of her home while she slept, according to the Montgomery County Sheriff’s Office. In Houston, 89-year-old Agnes Stanley was found floating in four feet of water in her home Sunday and an unidentified 76-year-old woman was found floating in floodwater near a vehicle Saturday. In Harris County, the medical examiner’s office confirmed a woman was killed in flooding Saturday, according to AP. She appeared to have exited her vehicle in high water and was found 30 yards away by neighbors. The Houston Fire Department said a man died in floodwaters overnight Saturday into Sunday. 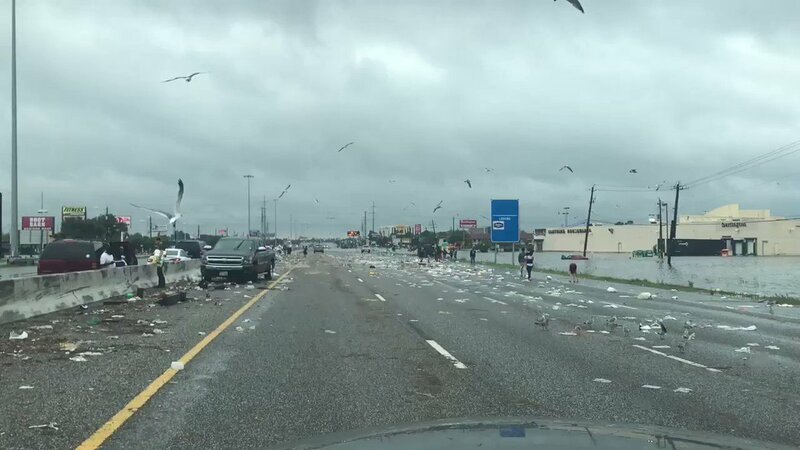 Two people reportedly died in Galveston County Sunday. A Rockport man was killed when his house caught fire at the height of the storm, according to media reports. Travis Lynn Callihan, 45, of Houston drowned after he exited his vehicle and was carried away by floodwaters. Friendswood Police spokeswoman Lisa Price said Tuesday that a boater helping rescue people from Harvey floodwaters discovered a deceased man, AP reports. Authorities are not yet sure how the man died and have not yet confirmed his identity. “I’m just hoping we find the bodies,” Saldivar said. Houston Police Chief Art Acevedo told the Associated Press Tuesday that his agency has rescued roughly 4,100 people, and Houston Fire Chief Samuel Peña said his agency has saved more than 3,000. Harris County Sheriff’s Office spokeswoman Parisa Safarzadeh said her agency has rescued more than 3,000 people, and U.S. Coast Guard Lt. Mike Hart says they have also rescued more than 3,000, both in Houston and in outlying cities and subdivisions. Overall, more than 13,000 people have been rescued in the Houston area. The military’s role in Harvey rescue and recovery efforts has been limited by weather and flooding but could soon expand by tenfold or more, a senior National Guard officer said Tuesday. Houston Mayor Sylvester Turner announced Tuesday that the Toyota Center is open as an additional shelter for evacuees. The facility was opened to alleviate crowding at the George R. Brown Convention Center, which has doubled its capacity of 5,000. American Red Cross spokesman Lloyd Ziel told AP that 10,000 evacuees have entered the George R. Brown Convention Center as of Monday and more are still arriving. Unless volunteers can find more cots, some people will have to sleep in chairs or on the floor. The Red Cross said on Tuesday that there are more than 17,000 people in Texas seeking refuge in shelters. Officials in Dallas opened the Kay Bailey Hutchinson Convention Center Tuesday as a mega shelterfor 5,000 Hurricane Harvey evacuees, WFAA.com reports. Mayor Mike Rawlings says the center will operate as a “mini city,” with a pharmacy area provided by Walmart and amenities such as phone charging stations. City officials have made a formal request with the Federal Emergency Management Agency for more supplies, including cots and food, for additional 10,000 people, which he hopes arrive no later than Wednesday, the mayor said. After facing criticism for not acting to help families displaced by the storm, televangelist Joel Osteen opened his 16,000-seat megachurch in Houston Tuesday to evacuees. There are 230 shelters open in the state of Texas. Two flood control reservoirs have overtopped their banks in Houston, sending floodwaters over spillways, despite Army Corps of Engineers officials releasing water from both. Elsewhere in the city, a bridge over Greens Bayou has collapsed near the Cloverleaf area, according to emergency management officials. Jeff Lindner, with the Harris County Flood Control District, said Tuesday that he’s certain that more homes and streets will flood as a result of the reservoirs filling. Lindner says the county is trying to determine where the water will go, specifically from the north end of the Addicks reservoir, but that some homes will be inundated for up to a month. Mayor Sylvester Turner said in a press conference Tuesday that there would be uncontrolled releases from Addicks for at least that long. Brazoria County emergency management officials are reporting that the Brazos levee near Columbia Lakes has breached. Flash flooding is already occurring, and all residents have been urged to evacuate now. The reservoir flooding is just adding to the misery in Houston, where more than 13,000 people have been rescued since flooding from Tropical Storm Harvey began, officials said Tuesday. Workers and nearby residents of a chemical plant in Crosby, Texas, had to be evacuated Tuesday after flooding brought on by Harvey submerged backup generators and created the risk of a fire or chemical explosion. Officials with Arkema say the situation at the facility had become serious, according to a release. It has been closed since Friday, but a small crew of 11 had been riding out the storm over the past few days. The plant has been without electricity since Sunday. The company manufactures organic peroxides that need to be stored at low temperatures, which has been a challenge due to the lack of power, states the release. The products have been moved to diesel-powered refrigerated containers that are being monitored by officials. Mayor Sylvester Turner imposed a curfew on the city Tuesday in an effort to ensure public safety, according to AP. The order was scheduled to last until 5 a.m. Wednesday. Turner enacted the order to prevent property crimes at evacuated homes, Chron.com reports. He said he did not want flood victims to be concerned about break-ins while they are displaced. “Don’t victimize our victims. We will come after you,” Acevedo said in a statement obtained by KHOU.com. Needless to say, countless businesses and organizations are indefinitely closed. More than 200 school districts and charter schools statewide, including schools for 216,000 students in Houston, canceled or delayed classes as the storm approached. With many schools flooded and the extensive damage that will need to be repaired, it is unlikely they will be opened any time soon, the AP reports. Operations at both Houston’s Hobby Airport and the George Bush International Airport have been closed for days but will reopen at noon on Thursday.